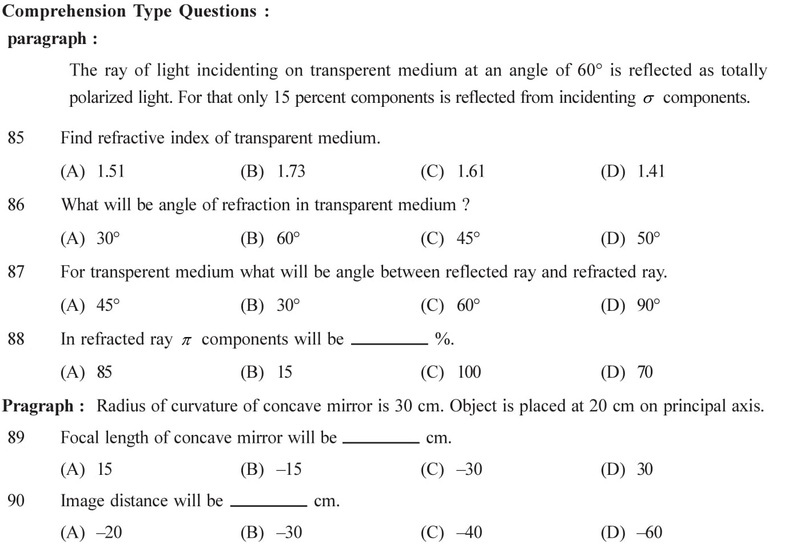 NCERT Solutions for Class 12 Physics Chapter 10 Wave Optics in PDF form to free download. See NCERT Sols of other subjects also. 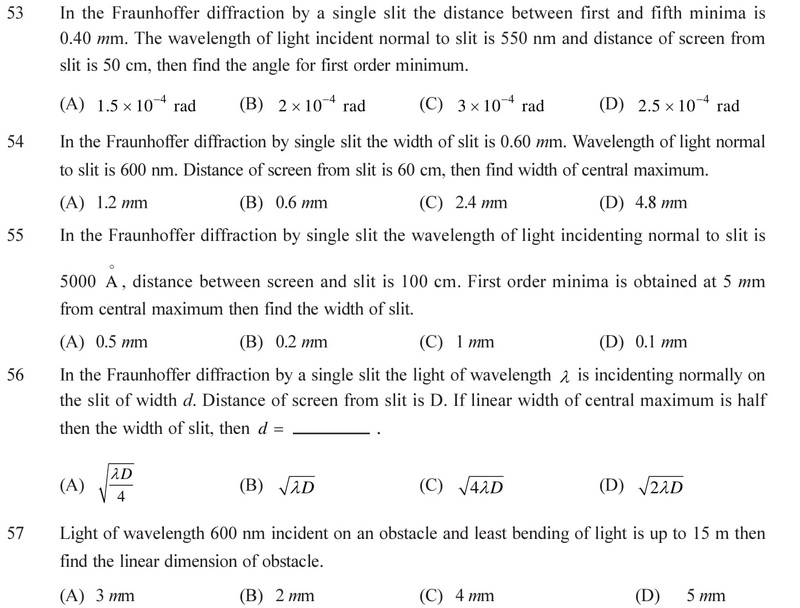 There are some additional questions based on wave optics are given below with answers. 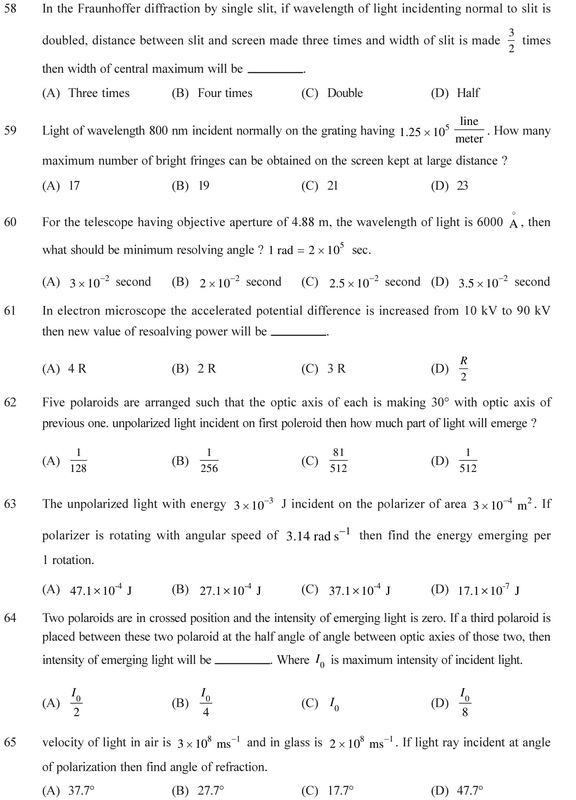 Download NCERT Solutions for Class 12 Physics Chapter 10 Wave Optics in PDF form with the links given below. The questions given below are based on HOTS (Higher Order Thinking Skills), which are frequently asked in competitive exams as well as CBSE board exams. After completing the NCERT Chapter, students are advised to see theses questions to score much better in their forthcoming exams. 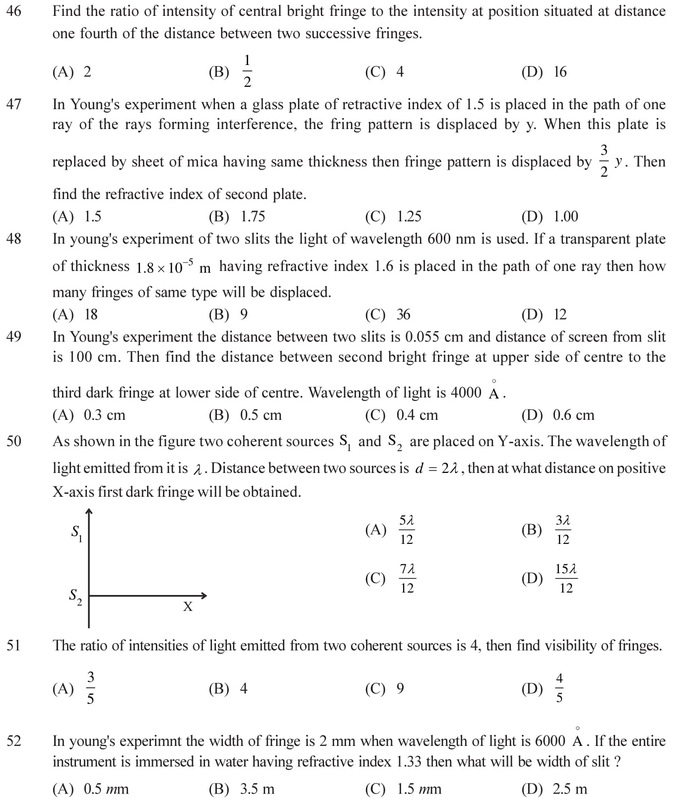 Here question number 43 to questions number 100 are given. For question number 1 to 42 Click Here. Young’s double slit experiment (YDSE) to observe the intensity of fringes and pattern during interference. Amplitude, phase difference, average intensity of light at a point due to superposition of two harmonic waves, emitted from two point like sources. Condition for constructive and destructive interference, fringe width, Doppler effect of light and Radar. See Answers. 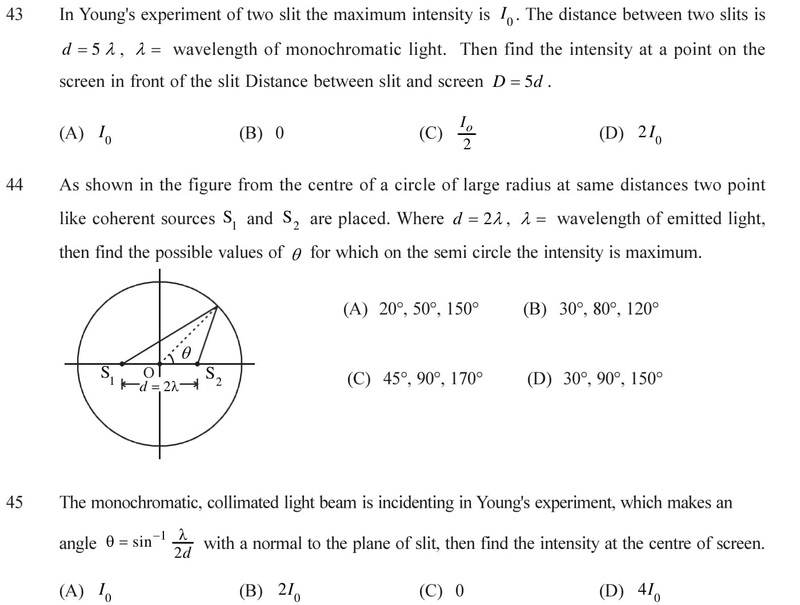 Central maximum and intensity during diffraction, Fresnel distance and limitation of ray optics. 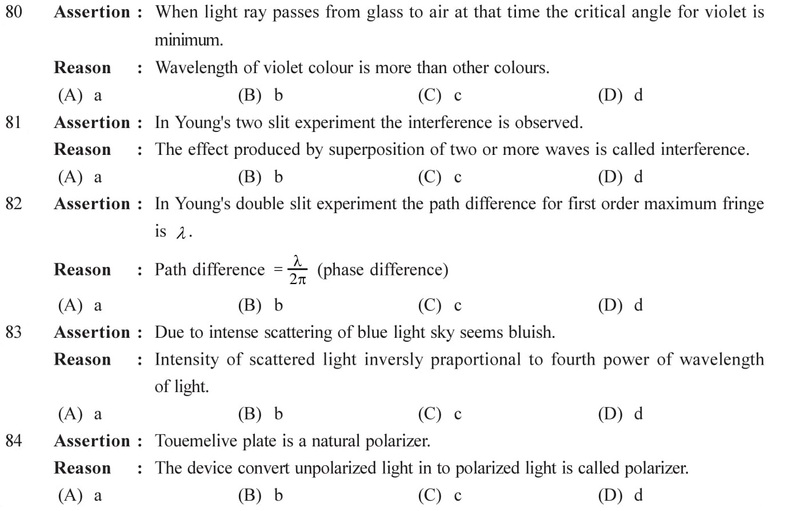 Polarization of light and Malas law for polarization. In the diffraction due to circular obstacle the central ring formed is bright. Which is called Airy’s disc. In the surrounding of it bright and dark concentric rings are observed which is called Airy’s rings. See Answers. 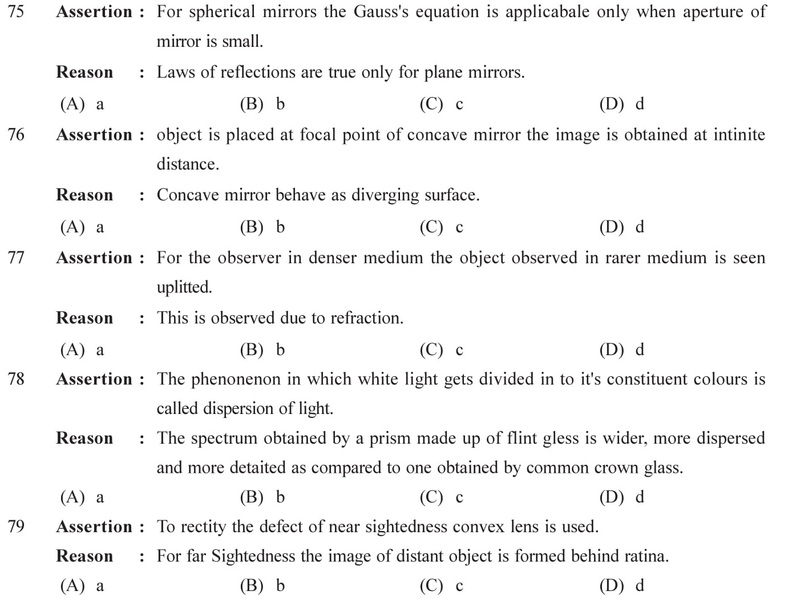 Convex mirror and Concave mirror, To measure focal length of convex lens. Draw the graph of angle of deviation versus angle of incidence using equilateral prism.From that determine refractive index of material of prism. Determine refractive index of a slab using traveling microscope. See Answers. Following questions are based on comprehension. Carefully read the paragraph and then try to solve the problems. See Answers. 43 (B), 44 (D), 45 (C), 46 (A), 47 (B), 48 (A), 49 (C), 50 (C), 51 (D), 52 (C), 53 (B), 54 (A), 55 (D), 56 (C), 57 (A), 58 (B), 59 (C), 60 (A), 61 (C), 62 (C), 63 (A) 64 (D), 65 (A), 66 (B), 67 (C), 68 (D), 69 (A), 70 (A), 71 (B), 72 (C), 73 (A), 74 (C), 75 (C), 76 (C), 77 (A), 78 (B), 79 (D), 80 (C), 81 (A), 82 (B), 83 (A), 84 (A), 85 (B), 86 (A), 87 (D), 88 (C), 89 (B), 90 (D), 91 (C), 92 (A), 93 (B), 94 (A), 95 (D), 96 (C), 97 (B), 98 (D), 99 (A), 100 (D).